Have you just bought a flat? This is not end of story because you are in for moving house. Enjoy our assistance and forget about this problem. If you have enough stamina to go through this painful process on your own, rent our sturdy plastic bins and let us help you at least in this way. Select a tailor-made service to suit your needs, save yourself, your family and relatives some of the stress, and enjoy your time. 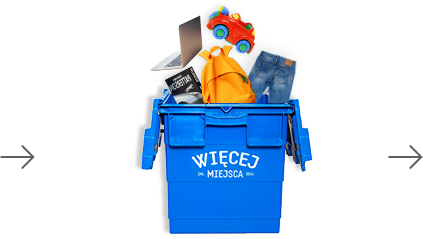 Plastic bins from Więcej Miejsca are a perfect solution if you are moving house, renovating or if you want to store or transport your stuff, such as documents and personnel files, clothes, shoes, books, small IT devices, kitchen appliances. Our storage bins are made of hardened plastic. They are durable, resistant to mechanical damage and waterproof. The bins are trapezoid-shaped. You can place five more bins on top of one. In this way, they take up little space. Owing to their sturdy construction, our bins are non-disposable. They don't need to be thrown away after use. You don't need to assemble the bins. You pack and unpack your stuff quickly and easily – just open and close the lid. Use the side handles to carry the bins. Fill in a simple form. Get a free quote. We deliver and collect the bins to and from your doorstep. DO YOU NEED HELP WHEN MOVING YOUR PLACE? We can transport for you a few items, small and large, or the whole flat or office. 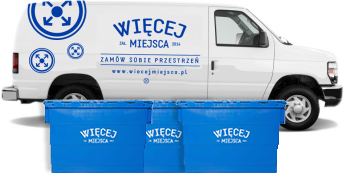 We offer assistance in moving house mainly in Warsaw and within the Warsaw area, but if necessary, we can help you move house to a different city or town or from a different city or town to Warsaw. A few days before moving house, we will deliver our sturdy bins for you to pack your personal belongings. We can do it for you if you wish. If necessary, we can store some of your items in our storage rooms before they get to your new flat or office. We can help you go through moving house quickly, comfortably and pleasantly. Storage bin rental Minimum rental terms: at least 10 bins for at least one week. You can rent the bins for a shorter period, but you will have to pay the rental fee for one week, anyway. Delivery and collection of storage bins The fee for the delivery and collection of the bins depends on the number of bins that will be delivered to you. We deliver the storage bins to your place. We collect your items. You can simply relax. Whoever moved house or apartment on their own knows how much time, stress and effort it takes, especially in a large city, such as Warsaw. 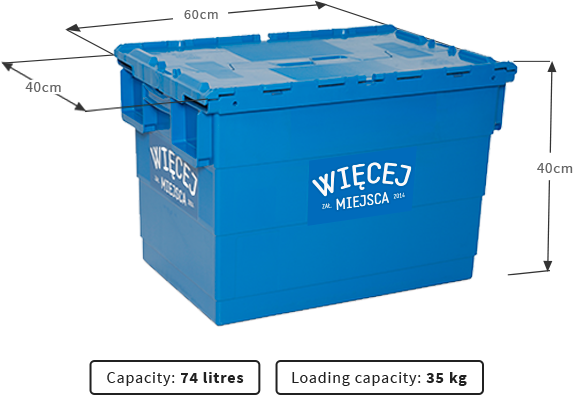 Więcej Miejsca wants their clients to have pleasant memories of their old and new place of residence or work. That's why we would like to offer you a modern approach towards moving house. Instead of traditional cardboard boxes, we use our own sturdy storage bins. If you have to leave your current flat or office, but cannot move into the new one yet, we will collect your items and keep them in our secure storage rooms. We will store them for you as long as necessary, and create an online catalogue of the stored items. In this way, you can view the list of stored items at any time, and place an order for their return when you need your stuff back. So, if you have no time to deal with moving house, or if you don't feel like doing it, or if you are too exhausted – let us help you. We will offer you our full commitment and support from the very beginning.